The SCC is a wavetable sound chip, just like the Gravis Ultra Sound, Sound Blaster (AWE)32 and Moonsound. They all have memory (tables), in which samples (waves) are stored. The samples are played back looped. The speed with which the samples are played, determines the frequency of the tone. A modern wavetable sound module usually has over a megabyte of memory, while the SCC has 128 bytes of memory. My Salamander SCC IC reads: "KONAMI 051649 2212P003 JAPAN 8750AAA". d-fader's F1 Spirit reads: "KONAMI 051649 2212P003 JAPAN 8723AAA". d-fader's King's Valley 2 (MSX1) reads: "KONAMI 051649 2212P003 JAPAN 8836EAI". My Haunted Castle (Arcade PCB): "KONAMI 051649 2212P003 JAPAN 8802EAI". You'll notice that the first two digits stay between 87-88 (they seem to have made all the chips between 1987 and 1988) and the next two digits are between 01-52 (only 52 weeks in a year). This SCC was also used in several arcade games made by Konami. As far as I know they are: Haunted Castle, City Bomber, Hexion, Nyan Nyan Panic. All of these are emulated by mame. Apart from the SCC (known as K051649 in MAME) they also use an YM3812 (OPL3) for music and another chip for samples. 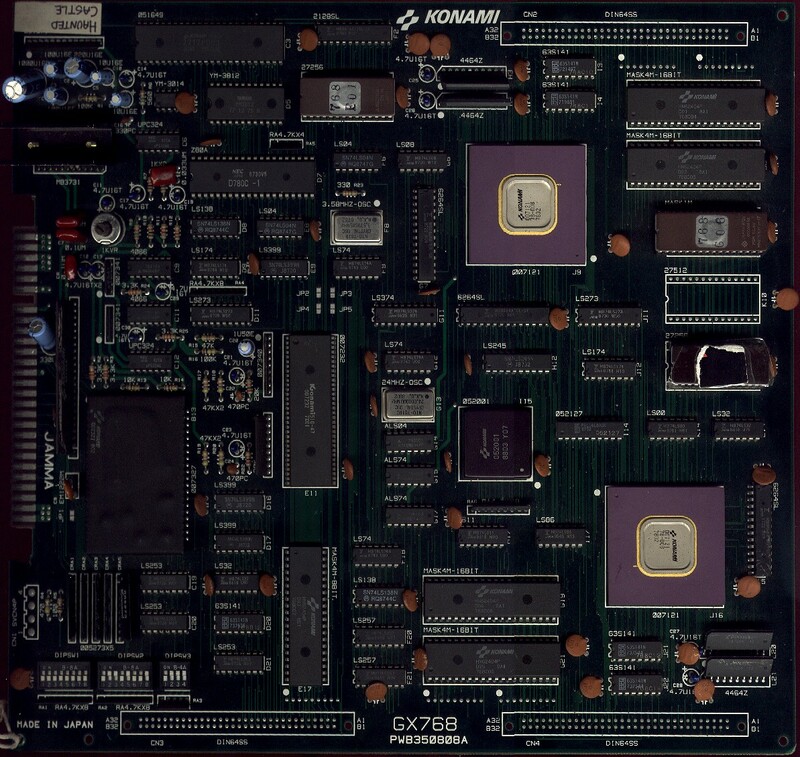 I've got the Haunted Castle PCB, Levien van Zon has made an excellent scan of it. To the left of the SCC (which is at the top-left) you can see the resistors packed into one device (which is for D/A conversion). You can also see the YM3812 (OPL3) and the Z80A. Just like the bank select registers, the SCC is accessed through memory mapped I/O, and not through I/O ports. If you write xx111111b (3Fh, bits 7 and 6 are ignored) to bank select register 3 (memory area 9000h to 97FFh, see megaROM mappers for more information), the SCC can be accessed through memory area from 9800h to 9FFFh. The register structure is similar to the PSG. As you may have noticed, channel 4 shares its waveform with channel 5. The SCC+ has five waveforms so each channel has it's own waveform. See SCC+ Sound Cartridge for more information. The waveform is made up of 32, signed (two's complement) bytes. The waveform represents the actual form of the tone the sound chip produces. It's played back from byte 0 to 31, and then again from 0 to 31, etc. A value of 0 means no amplitude. From 1 to 127 results in an increasingly higher amplitude. From -1 to -128 (FFh to 80h) results in an increasingly higher negative amplitude. The frequency is stored the same way as in the PSG. The first byte contains bits 0 to 7 from the frequency. Bits 0 to 3 of the second byte contain bits 8 to 11 of the frequency. Bits 4 to 7 of the second byte are ignored. Remember that the value you enter is a period: a higher value gives a lower frequency. The volume is stored in the same way as in the PSG, though it does not support envelopes. Bits 0 to 3 contain a volume of 0 to 15, and bits 7 to 4 are ignored. A volume of 0 is silent, and a volume of 15 is maximum volume. This register is not used by Konami. All the addresses in the memory area (98E0h - 98FFh) refer to the same register. It is set a different memory area in the SCC+ (Sound Cartridge). I haven't ever seen a description of this register, but by sampling the SCC on my PC, I've tried figuring out it's function. The default value seems to be 0. If the noise bits are set to 01B, channel 4 and 5 produce noise (=random frequencies near TP), and if the bits are set to 11B, channel 4 and 5 produce noise with envelopes. This is as much as I've figured out so far. It probably isn't (completely) correct, but I'll continue to try and figure it out. If you think you can help me in any way, please do so. The memory area from 9800h to 987Fh behaves as RAM. The memory area from 9880h to 98FFh is write only; if you read it, it'll always return FFh. The memory area from 9900h to 99FFh has exactly the same function as from 9800h to 98FFh. The same accounts for the area from 9A00h to 9AFFh, and so on to the area from 9F00h to 9FFFh. This behaviour can be easily be explained: the SCC/Mapper does not process address line A8 - A10, thus it cannot distinguish 9900h from 9800h, or 9F00h from 9800h. See pinouts.txt for more info. The memory area from 8000h to 97FFh is a part of the ROM as you would expect it to be. How do you in which slot the SCC is? One way is to search the slots for cartridge with the 'AB' code that can be removed by writing a value other than 0 to the bank select register. However, in some cartridges the ROM is disabled; you won't find the 'AB' code. A better why is to search for a slot that contains ROM, and contains RAM at 9800h - 987Fh after writing 3Fh to 9000h. This will also work on the SCC+. However, not all MSX emulators emulate the RAM behaviour; it's not used by any Konami game. To use the SCC on a emulator, assume that it is in slot 1 - 0, and write 3Fh to 9000h, and write your data to 9800h - 988Fh. I have a disassembler/monitor called monMSX, and if I view the SCC wave memory with it, it starts behaving very erratic. Every time its memory is read, it returns different values. Writing values does not seem to have any effect either. CJS documents page (archive.org) - Dutch only!